Let’s call the Khaki King an unconventional twist on traditional take. 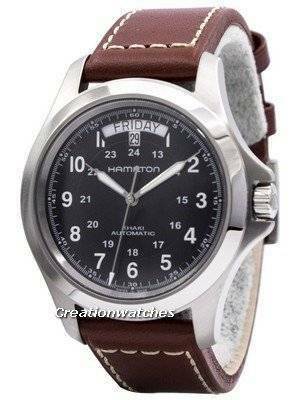 The toughness of Hamilton’s military design disguises itself within an elegantly crafted brushed-steel case. The case also hides the self-winding movement with ball-bearing, bi-directional central rotor, Swiss lever-escapement and ETACHRON Regulator System and protected with Incabloc shock protection. My order arrived on Monday it took less than one week so yes it was super fast and it is the newer version with the updated escapement, brand new with all documents. This watch has got the day & date, they are at the right spots and the hands are reasonably skinny so not blocking the view. 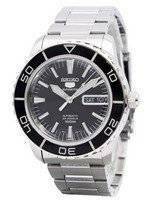 The watch runs about +5sec per 24hrs which is acceptable. I also like the understated design of the dial, a little smaller than the case along with the dome shaped glass make the watch appears to be a little smaller on the wrist. It comes with the rugged looking full genuine leather strap which is a perfect match to the style of the watch. My only complain is the clasp which can catch the sweater sleeve very easily so I am swapping it with a NATO strap next week. Finally it would be much better if Creation Watches could show the total cost including taxes, DHL processing and transaction fees so there would be no surprises!! 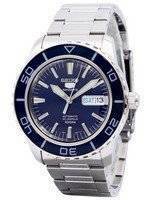 But then again their price particular on this watch is very good. Watch revelation, the leather belt looks much better than the bracelet. Perfect delevery , about watch it S ok ! 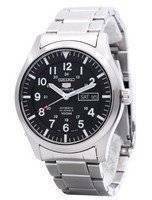 I m following Seiko sarb models but i m waiting for a discount to buy other Watch ! 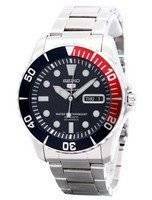 Another great deal from Creation Watches: Price, Quality, and Quick delivery. amazing shipping speed, i orded from saturday and got my watch on morning next monday, thanks creationwarches. i will come back here again. 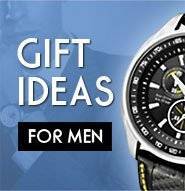 This watch gives a great feeling of quality. Pictures can not show how nice it really is! 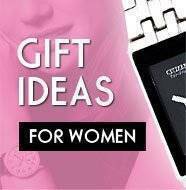 It is just a pleasure to shop from Creationwatches. Third watch from Creation Watches in 3 months. Great service, products and incredible speed of delivery everytime. The watch itself is awesome, incredible quality. Some might find that at 40mm it's a little small for their taste. For me, it's absolutely perfect. Absolutely nothing to complain about. Charge on the card was only applied once Fed Ex had received the item. Watch delivered in 4 days from Singapore to Paris. Perfect, defintely not my last purchase Thank You!!! !